The Pacific tropical season has been an active one. We’ve seen 19 storms so far this year, with 16 being average total seasonal number. 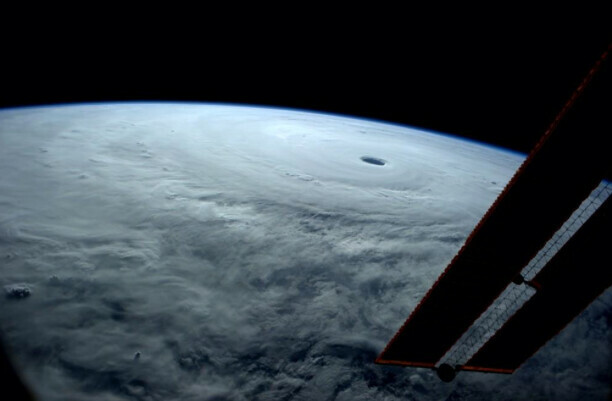 The 19th is Vongfong, currently hammering Japan. Meanwhile, the Atlantic season has been very quiet. Gonzalo is just the 7th named storm in a season that averages 12. 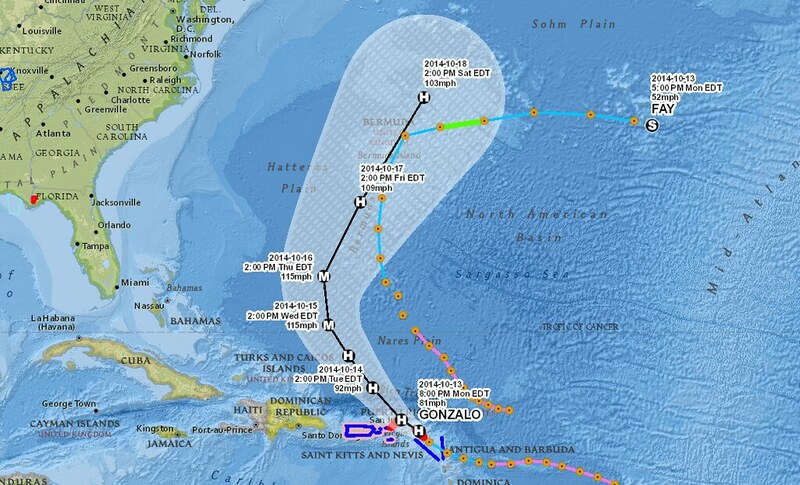 Gonzalo is not likely to impact the US as the current projection takes it over the eastern Caribbean islands north to northeastward over the open Atlantic, curling away from mainland US. While we typically defer our attention to the Atlantic for tropical system impact on the US,the Pacific can have a bigger impact on the weather the country experiences as a whole -- albeit indirectly. Well, about ten days after Haiyan slammed the Philippines, it’s energy contributed to the mid-November tornado outbreak in Indiana -- some 8,000 miles apart! 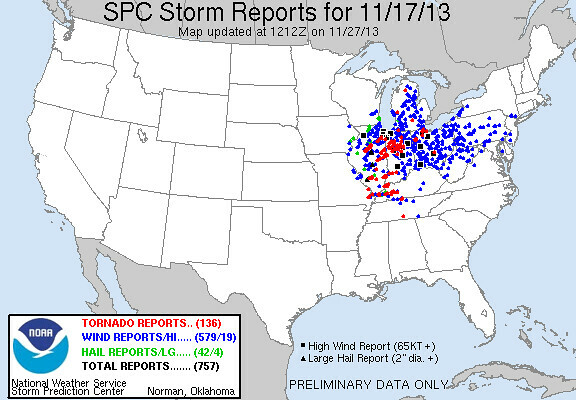 The 17th of November, 2013 had 73 tornadoes across the midwest, most in Indiana and Illinois. Two of those 73 were rated EF-4. (yes this report page says there were 136 tornadoes, but remember those reports may include multiple reports for the same tornado). That outbreak was the second worst in Indiana history, and, yes, it happened out of the traditional severe weather season, but during what’s often referred to as “second season”. Compare Haiyan to Vongfong Vongfong, meaning ‘the wasp’, first made landfall near Okinawa, Japan on Sunday with wind more than 100 mph. Just Friday the storm had wind of 155mph. At least 61 people were injured, and more than 44,000 were left without power; one person remains missing from the storm’s impact Sunday, according to the Japan Times. Imagine the chaos involved with the 506,000 people ordered to evacuate. Especially with much of public transportation shut down with nearly 16 inches of rainfall expected. This is the second typhoon to hit japan in a week, last week we were tracking Typhoon Phanfone which is the one that killed three us airman stationed at Okinawa. Although Vongfong is one of the strongest this season, the typhoon did not reach the intensity of Haiyan. Haiyan had a minimum central pressure of 895mb and peak wind of 195mph versus Vongfong’s 900mb minimum pressure and 155mph peak wind. Like Haiyan, Vongfong (and Phanfone for that matter) has utilized a lot of potential energy to create itself. Typhoons contain a great deal of energy -- we are talking energy on the order of tens of thousands of nuclear weapons. In the meteorology community, this energy is known as vorticity, or spin of the storm. This energy doesn’t simply disappear as a storm weakens and dies; it is utilized by the atmosphere somewhere else. In the case of the past two typhoons that hit Japan -- Phanfone and Vongfong -- their energy is grabbed by the jetstream and taken toward Alaska and the lower 48. So, Japan may have been hit directly by the typhoons, but we too may have that energy impact us down the line. Toward Halloween, we will be tracking several pushes of colder air that will try to hit our area. The Great Lakes and Eastern US will certainly feel the cold, but Colorado may be on the edge of these systems. The energy pushing this cold at us is partially that from the typhoons. Weather is a “crazy cycle”. The CFSv2 and ECM are hinting at some cold conditions with associated 500mb troughing near late October and early November. Part of the energy creating these troughs is that of the current typhoon(s).